Unleashing three albums in the space of five years, the Maltese quintet has become a fairly prolific force and rather than being content to rest on their laurels this is their boldest thus far. Always direct, the atmosphere is darker. There is an urgency in the delivery and it’s venomous too. Jordan Cutajar is a commanding front man, almost terrifying, in the way he spits his words with cutting clarity. Given that these same elaborate lyrics were penned by bassist Albert Bell, his authenticity is all the more commendable. He believes and the listener will too. Look no further than the menacing “Descent To Hell” or “Age of Contempt” where Cutajar holds his own against the formidable backdrop of stabbing keys, rumbling bass and pounding drums. High praise too for the alternating lead breaks by organs and guitars, which ooze and scream ’70s class. 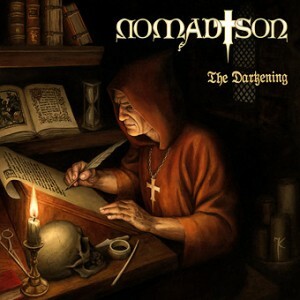 Nomad Son has striven to hone a style that transcends genres so it might seem fitting that “The Devil’s Banquet” appears third as the first archetypal offering of classic Doom Metal. Its eerie introduction unfolds with apocalyptic certainty and true enough, the heavens open and thunderous damnation rains down on the sinners. Delightfully tight song craft through and through yet it is the other flashes of inspiration that impress deeper. If in the past, the organs ever bordered on overbearing Julian Grech has now found that delicate balance. His contribution to the chorus of “Light Bearer” has a haunting beauty and the way he underpins the melodic majesty of “Only The Scars” elevates them both to firm favourites in the canon. The latter, in particular, has that Heavy Metal grandeur of “Dehumanizer” with Dio giving his all. Mighty. Strangely though, it’s the dawning of the title track where the record makes less impact. The chorus is catchy, really catchy, and forms the heart of the song. But the tone and stride outside of that movement recalls a somewhat accelerated version of the flat “So Long Suckers” by Reverend Bizarre. It is reinforced by the plodding nature of “Caligula” which feels too long. Even the more typical “Orphaned Crown” does not wholly redress that sinking feeling. If is difficult to explain because there is so much to admire in this latter part of the album. Perhaps the first five compositions, for me, are too high a high. A matter of contrast than absolute. Minor misgivings aside, I truly want to catch the band live and anticipate they will scale many more peaks to come.